The retailers with the advantage in 2019 and beyond are the ones that are able to continually leverage technology to provide a better customer experience. While there are many technologies that retailers are experimenting with from artificial intelligence to augmented reality to mobile payments here are three digital trends you should pay attention to in 2019. Using Nike’s “Scan to Try” functionality on Nike’s mobile app customers can scan the barcode on any product in the store using the app to learn more about a product and see what colours and sizes are available. With the app customers can also see if a product is in stock, or if it is available at nearby stores or online all without speaking to anyone. Using the app customers can also request that a sales associate bring items to designated locations in the store or have items placed in a fitting room. After making the request through the app, the app shows the customer that the sales associate has received the request and is in the process of retrieving the product for the customer. Using Nike’s “Instant Checkout” functionality customers can pay for their purchase by scanning the bar code on a product using Nike’s mobile app. After paying for the purchase within the app members can skip the checkout line and walk out of the store with their items. Instant Checkout stations are placed throughout the store so that customers can bag their own items if they choose to do so after paying for their purchase. To use these features customers must be members of NikePlus, Nike’s loyalty program. Turning our mobile phones into digital shopping assistants is the next evolution of retail. Augmented reality (AR) can help to reduce the friction that exists while shopping online. Wayfair, an online furniture company, has functionality called View in Room 3D in its main mobile shopping app. Using only a smartphone, a customer can virtually place a piece of furniture in their home. The technology makes it easier to see what fits and what goes well with a customer’s décor before they make a purchase. The functionality was created using Apple’s AR platform ARKit and is also available to Android users leveraging Google’s ARCore platform. To provide a sense of how new this functionality is, Apple’s ARKit, which allows developers to create augmented reality experiences for users on iOS, was released in September of 2017 and Google’s version called ARCore was only released in February of 2018. The Co-Founder and Co-Chairman of Wayfair, Steve Conine has said that “we knew early on that augmented reality had the potential to completely transform the way people shop for their homes, and as it’s quickly moved toward mainstream adoption, we’re excited to have played an integral role in shaping the experience for millions of shoppers.” Other retailer apps that use AR include IKEA Place, Lowe’s Vision: In-Store Navigation and Sephora Virtual Assistant. It looks like the future of search is visual. According to an eMarketer report, the majority of US internet users (52.3%) would like to see related products after using a retailer’s mobile app to take a picture of an item. Betting on the future of this technology, Pinterest launched Pinterest Lens in 2017. It uses artificial intelligence to show similar products after a user has taken a photo of an object. Ben Silbermann, CEO of Pinterest has said: “I really believe that the camera will be the next keyboard. It will be a fundamental tool you use to query the world around you, discover things around you, or visualize how something might fit into your life”. Since launching Pinterest Lens in 2017, there are more than 600 million monthly visual searches. 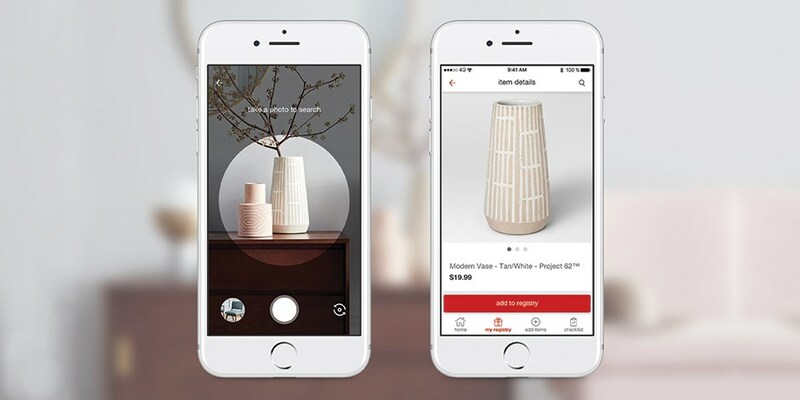 Recognizing the potential of this technology Target became the first retailer to incorporate Pinterest’s Lens technology into its own mobile shopping app. Initially launched for products within Target’s registry, customers can take a picture of a crib and receive recommendations for similar products that customers can purchase at Target. Target plans to expand the functionality to its entire product catalogue. The hope is for customers, while conducting their day-to-day activities, even when they are not shopping, to see an item they like, take a picture of it using Target’s app and then find similar items to purchase at Target. Other retailers that offer visual search functionality within their apps are: ASOS, Neiman Marcus, H&M, Forever 21 and Home Depot.